Home / Chemicals in the Water / WHAT MAKES OUR WATER FILTERS UNIQUE? 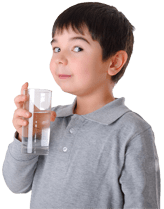 WHAT MAKES OUR WATER FILTERS UNIQUE? 1) Quality and 2) Quantity of the Filtration Media. Many water filtration products use less-expensive filtration media, and therefore, filter very fewer contaminants. Some only remove the taste and odor of chlorine, for example. Secondly, most water filtration products do not tell you how much filtration media is included. (BUT WE DO!) In some cases, very little media is being used, which is why the amount is not marked on the product, and in turn, little filtration occurs. How much filtration you get is a result of contact time between water and filter media. More media means more filtration. Not all media filter everything. For example, carbon is a good filter material. But there are many things it cannot do. One of the ways our water filters are unique is due to the FOAM ADVANTAGE , which increases contact time, and therefore levels of filtration and length of effectiveness. The solution is to get a water filter with the right (high quality) filter materials. The patented process foam filter used in most of the water filters we sell further increases contact time between water and filter material. The result is increased porosity resulting in more and longer-lasting filtration – while keeping a strong water flow.